Let’s face it: injuries are debilitating both physically and emotionally. The frustration of dealing with pain adds to that of not being able to do the things that you love, whether it is about going to the gym or everyday activities. And this includes attending your yoga classes. How do I know? I was in exactly the same place, nearly giving up hope, and let surgeons chop my neck. Pain wasn’t just paralyzing for my body, it nearly paralyzed my ability to think. Getting out of that state felt like being given new life plus a set of wings for bonus! What I learn from my recovery process has been the seed for the Yoga Fundamentals program. This program gives you a strong foundation for an injury-free yoga practice. Modified Practice: basic yoga poses and transitions in a modified form, using props. Accessible to beginners, those dealing with injuries, physical limitations, or in need of a gentler yoga practice. 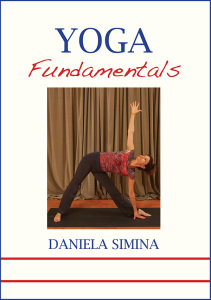 Standard Practice: basic yoga poses and transitions, at a higher level of intensity. Suitable for fit individuals. Breathing: basics of proper yogic breathing, which should accompany any yoga practice. Sun Salutation: three traditional series, in standard and modified form. Play repeatedly for a self-standing practice. Savasana: includes a guided fractional relaxation. Use it independently for a quick recharge and refresh. Here is a sample practice. Hey Daniela, it looks like you have another winner with your new dvd. Congratulations! What makes this program unique is the fact that you get several variations for each potentially problematic pose. These variations apply to common injuries of the back, neck, knees, hips, and shoulders. Q: If I injured in a yoga class with the teacher standing next to me, how could practicing with a DVD be safer, or more beneficial? You can watch the DVD first and get familiar with the poses, transitions and modifications. Focus on your specific issues that you want to address. Most of the modules in this DVD are slow paced; you are not forced to pick up the pace unless you feel like doing so. The alignment guidance is very detailed; just follow along and you will get into the right pose the right way. Q: Doesn’t get boring to do the same thing over and over again? Practice makes perfect. As you follow along, you will discover new details and your experience will deepen. You can play the different modules independently to meet your needs and time budget. Q: What should I do if I still have questions?